One question that I constantly get from my clients is how to secure the sensitive data on their copier. I recently discovered this guide online and I thought that it was great information. Please read this carefully and apply it to your business as best you can. Does your company keep sensitive data — Social Security numbers, credit reports, account numbers, health records, or business secrets? If so, then you’ve probably instituted safeguards to protect that information, whether it’s stored in computers or on paper. That’s not only good business, but may be required by law. According to the Federal Trade Commission (FTC), the nation’s consumer protection agency, your information security plans also should cover the digital copiers your company uses. If the data on your copiers gets into the wrong hands, it could lead to fraud and identity theft. Commercial copiers have come a long way. Today’s generation of networked multifunction devices — known as “digital copiers” — are “smart” machines that are used to copy, print, scan, fax and email documents. Digital copiers require hard disk drives to manage incoming jobs and workloads, and to increase the speed of production. But not every copier on the market is digital: generally, copiers intended for business have hard drives, while copiers intended for personal or home office use do not. The hard drive in a digital copier stores data about the documents it copies, prints, scans, faxes or emails. If you don’t take steps to protect that data, it can be stolen from the hard drive, either by remote access or by extracting the data once the drive has been removed. Digital copiers store different types of information in different ways. For example, photocopied images are more difficult to access directly from the hard drive than documents that are faxed, scanned or printed on the copier. Copiers often are leased, returned, and then leased again or sold. It’s important to know how to secure data that may be retained on a copier hard drive, and what to do with a hard drive when you return a leased copier or dispose of one you own. It’s wise to build in data security for each stage of your digital copier’s life-cycle: when you plan to acquire a device, when you buy or lease, while you use it, and when you turn it in or dispose of it. Make sure it’s included in your organization’s information security policies. Copiers should be managed and maintained by your organization’s IT staff. Employees who have expertise and responsibility for securing your computers and servers also should have responsibility for securing data stored on your digital copiers. Evaluate your options for securing the data on the device. Most manufacturers offer data security features with their copiers, either as standard equipment or as optional add-on kits. Typically, these features involve encryption and overwriting. Encryption is the scrambling of data using a secret code that can be read only by particular software. Digital copiers that offer encryption encode the data stored on the hard drive so that it cannot be retrieved even if the hard drive is removed from the machine. Overwriting — also known as file wiping or shredding — changes the values of the bits on the disk that make up a file by overwriting existing data with random characters. By overwriting the disk space that the file occupied, its traces are removed, and the file can’t be reconstructed as easily. Depending on the copier, the overwriting feature may allow a user to overwrite after every job run, periodically to clean out the memory, or on a preset schedule. Users may be able to set the number of times data is overwritten — generally, the more times the data is overwritten, the safer it is from being retrieved. However, for speed and convenience, some printers let you save documents (for example, a personnel leave slip) and print them straight from the printer hard drive without having to retrieve the file from your computer. For copiers that offer this feature, the memory is not overwritten with the rest of the memory. Users should be aware that these documents are still available. Overwriting is different from deleting or reformatting. Deleting data or reformatting the hard drive doesn’t actually alter or remove the data, but rather alters how the hard drive finds the data and combines it to make files: The data remains and may be recovered through a variety of utility software programs. Yet another layer of security that can be added involves the ability to lock the hard drives using a passcode; this means that the data is protected, even if the drive is removed from the machine. Finally, think ahead to how you will dispose of the data that accumulates on the copier over time. Check that your lease contract or purchase agreement states that your company will retain ownership of all hard drives at end-of-life, or that the company providing the copier will overwrite the hard drive. Take advantage of all its security features. Securely overwrite the entire hard drive at least once a month. If your current device doesn’t have security features, think about how you will integrate the next device you lease or purchase into your information security plans. Plan now for how you will dispose of the copier securely. For example, you may want to consider placing a sticker or placard on the machine that says: “Warning: this copier uses a hard drive that must be physically destroyed before turn-in or disposal.” This will inform users of the security issues, and remind them of the appropriate procedures when the machine reaches the end of its usable life. In addition, your organization’s IT staff should make sure digital copiers connected to your network are securely integrated. Just like computers and servers that store sensitive information, networked copiers should be protected against outside intrusions and attacks. Check with the manufacturer, dealer, or servicing company for options on securing the hard drive. The company may offer services that will remove the hard drive and return it to you, so you can keep it, dispose of it, or destroy it yourself. Others may overwrite the hard drive for you. Typically, these services involve an additional fee, though you may be able to negotiate for a lower cost if you are leasing or buying a new machine. One cautionary note about removing a hard drive from a di gital copier on your own: hard drives in digital copiers often include required firmware that enables the device to operate. Removingand destroying the hard drive without being able to replace the firmware can render the machine inoperable, which may present problems if you lease the device. Also, hard drives aren’t always easy to find, and some devices may have more than one. Generally, it is advisable to work with skilled technicians rather than to remove the hard drive on your own. To learn more about securing sensitive data, in general, read Protecting Personal Information: A Guide for Business at ftc.gov/infosecurity. The FTC works for the consumer to prevent fraudulent, deceptive, and unfair practices in the marketplace and to provide information to businesses to help them comply with the law. To file a complaint or to get free information on consumer issues, visit ftc.gov or call toll-free, 1-877-FTC-HELP (1-877-382-4357); TTY: 1-866-653-4261. Watch a new video, How to File a Complaint, at ftc.gov/video to learn more. The FTC enters consumer complaints into the Consumer Sentinel Network, a secure online database and investigative tool used by hundreds of civil and criminal law enforcement agencies in the U.S. and abroad. The National Small Business Ombudsman and 10 Regional Fairness Boards collect comments from small businesses about federal compliance and enforcement activities. Each year, the Ombudsman evaluates the conduct of these activities and rates each agency’s responsiveness to small businesses. Small businesses can comment to the Ombudsman without fear of reprisal. To comment, call toll-free 1-888-REGFAIR (1-888-734-3247) or go to sba.gov/ombudsman. The FTC’s standard for information security recognizes that businesses have a variety of needs and emphasizes flexibility: Companies must maintain reasonable procedures to protect sensitive information. Whether your security practices are reasonable depends on the nature and size of your business, the types of information you have, the security tools available to you based on your resources, and the risks you are likely to face. Depending on the information your business stores, transmits, or receives, you also may have more specific compliance obligations. For example, if you receive consumer information, like credit reports or employee background screens, you may be required to follow the Disposal Rule, which requires a company to properly dispose of any such information stored on its digital copier, just as it would properly dispose of paper information or information stored on computers. Similarly, financial institutions may be required to follow the Gramm-Leach-Bliley Safeguards Rule, which requires a security plan to protect the confidentiality and integrity of personal consumer information, including information stored on digital copiers. In my last post I discussed how businesses and professional practices can save money by optimizing their printing and copying processes. Click the link below to check out this case study, shown as an infographic, outlining how I saved a client almost $5,000 per year on their copying and printing. If you haven’t heard the term Managed Print Services you will soon be hearing it a lot more. Managed Print Services are a fantastic way to save your business time and money. Below I have re-posted a recent article about Manged Print Services written by Bill Melo. Mr. Melo is the Vice President of Marketing, Services and Solutions for Toshiba. I think this gives a great overview of what MPS is and what the benefits are to your business. If you would like to explore the possibility of utilizing Managed Print Services to save your business time and money please feel free to call or email me. I would be happy to answer any of your questions. With an uncertain economy, businesses need to evaluate and streamline operations wherever they can. If you can save a buck without hindering productivity, that’s the first place you will target. A great place to look for savings is in printing. Many businesses do not know how much they spend on printing. Odds are they are spending more than they think. If you ask a CFO about her payroll costs, she could tell you off the top of her head. But printing is one of those costs that is buried somewhere under IT, operations or office supplies. As with any cost, you can’t control what you don’t measure. The first step in managing your printing is doing an assessment to analyze how and what you print. 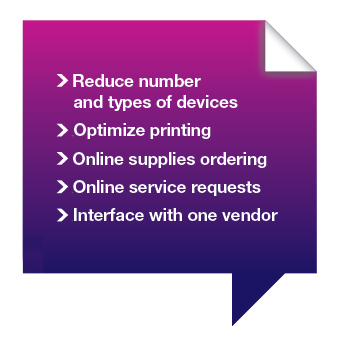 This is the first step to Managed Print Services (MPS). You want to measure existing output volumes, types of printing, paper sizes, and peak printing times. You need to understand the business processes that create printouts and how you use them. Once you measure the existing environment, you can discuss future needs. You can develop recommendations for streamlining existing business processes that will ultimately reduce time and cost. Some recommendations may be simple, like print double-sided by default. That can save up to 50% of your paper use. You might need to consolidate printers, replace older models with newer ones or change the mix of laser printers and MFPs. By putting everything under a predictable monthly payment, you can treat printing like electricity. You pay for what you use. MPS can help you save money, save energy and improve productivity since the latest printers will be quicker and may be more appropriate to your businesses requirements. Given the improved functionality of newer printers, you may decide to bring certain tasks in-house, saving on outsourcing fees. The goal is to make your printing predictable and efficient. Start by assessing your current print environment, decide how to streamline things, make the necessary changes and watch your costs drop and your productivity rise. Save your Healthcare Practice Time and Money with Software Designed Just for Your Practice! If you own or manage a health care practice in the Baltimore, Maryland or Washington DC area than Lexmark’s Clinical Assistant software is something you really should know about. The Lexmark Clinical Assistant is a software bundle for Lexmark multifunction printers (MFPs) customized specifically for the healthcare industry. Clinical Assistant applications are designed to address common workflow challenges in clinical environments to help increase staff productivity and reduce errors. Take a look at this video for a quick overview. Here at my company we always have used machines coming in that are just off lease. I would assume this is true for most copier companies, not just us. The real question is, are used copiers a good deal or is it best to lease or purchase a brand now copier/multi-Function device. The answer is yes, used copiers can be a fantastic deal. Like most technology products, copiers are constantly being upgraded by adding new features and improving efficiency. Because of this, you can get some good deals on off-lease machines with under 100,000 copies/prints on them. Here at my company we sell Toshiba copiers. For a Toshiba machine 100,000 copies is a very low volume. In other words, I would not hesitate for a second to sell my client a Toshiba copier with that volume of copies on it. I would consider this a machine with many, many years of usefulness left on it. The bottom line is you have to take in consideration your business copy/print volume and then decide if a used machine is right for you. If you are a high volume user, I may suggest you lean towards a new machine, but for the average small office a used machine may be a perfect fit for your budget and your needs. Here at my office we have several used Toshiba e-Studio Copiers that start at around $1,500.00. These are great prices for really solid Toshiba Copiers. So in summary, yes you can buy a used copier and get a solid machine at a great price. Copier jamming is one of the biggest frustrations in an office environment. Unknown to many office workers is the fact that humidity is a major cause of jamming. Humidity in your office can cause paper being stored in a supply closet or in the copier drawers themselves to become damp, therefore, making the paper thicker which can cause jamming. Also if the paper is damp the small wheels that move the paper through the machine may not be able to get traction on the paper causing it to jam. If you hold the paper in your hand you really can’t tell it’s damp by the touch, but it is. If you pick up a ream of paper sometimes you can actually tell if it’s damp because it feels a little heavier than a dry ream. This is one indicator that you may have a humidity problem in the office. 1) Put a dehumidifier in office, preferably near where the paper is stored. If the paper is stored in a supply room or closet put the dehumidifier in there if at all possible. This will greatly reduce the amount of humidity in the air. 2) If you open a ream of paper try to reseal it as best as possible. Rather than open an entire end of the package as the package indicates just make a small slit and pull the paper out as needed. If possible put the leftover paper (still in the plastic that you made the slit in) back in the box it came in for storage. 3) Keep boxes (sometimes called cases) off of the ground. Put them on a shelf or on some type of pallet to keep them off the ground where there tends to be more moisture. 4) Try not to fill the copier drawers with paper if it isn’t going to be used within the next couple of days. Paper that sits inside the copier drawers will soak up humidity because the copier drawers are not airtight. If you have any copier or printer questions please feel free to call or email me and I’ll get back to you asap. Also if your company is in the market for a copier, printer, or document shredder please contact me for a competitive quote. In the months of February and March 2013 we are offering a free gift of an Apple iPad, a Toshiba thrive Tablet, a Toshiba laptop, or a 40″ Toshiba flat screen TV on qualifying copier purchases. Please contact me for details. Let’s face it, healthcare costs are skyrocketing and nobody knows how high they’ll go. That’s why it’s important than ever that your medical office is being as efficient as possible when it comes to managing your patient files and other important documents. Advances in document management technology have made it easier than ever to save time and money reducing costs and increasing office efficiency. Today’s document management technology dramatically reduces the amount of paper and toner used because many documents no longer need to be printed and stored in a paper file. The ability to store patient files and other documents electronically means less print-outs, less physical space needed to store files, and easier access to files. Most medical offices today have multiple printers as well as separate scanners, copiers, and fax machines. When you add up the cost of all of these devices it can get pretty expensive. By consolidating all of your devices into one multi-function device like a Toshiba e-Studio you can save considerable dollars for your practice. Several document management technologies can save your staff considerable time when performing manual, rote, and routine tasks. One such technology is Optical Character Recognition software. This software allows your office staff to scan hard copy documents directly into a copier/multi-functions device which are then converted directly into editable and searchable formats like Microsoft Word or Excel documents or PDF’s. Here at Action Business Systems-Toshiba we offer a software solution created by Toshiba called Re-Rite. Our software allows you to do the tasks mentioned above as well as convert incoming faxes in to editable formats and much more. The uses of Re-Rite are endless and we can customize them for your practice to save you time and money. If you would like more information on the latest document management products and services contact Ed Worthington at 443-570-0414.